First up we have the new StampTV Kit, which comes with both of these awesome holiday sets, Merry Little Christmas and City of David! I chose to work with City of David today. This is a simple two layer card! Stamp the greeting, image and the star above in Memento Tuxedo Black on Pure Luxury White. Next I cut a piece of scratch paper in a tall triangle long enough to cover my card. I put the tip under star, then started sponging Memento Sweet Plum over both sides of the mask. The I moved a bit and sponged on some Memento Paris Dusk, concentrating ink on the edges of mat, going off the sides. Repeat on the other side. Remove the mask. Add some bling! The masking really spotlights your sentiment. I added white dots randomly with a marker for stars. Cardbase is Pure Luxury In the Navy. Next we have this month's Free with Three set Holiday Tags. Very useful little set!! I went very literal this month and used them as ...yep..tags. :) Cardstock is Pure Luxury Ocean Mist, Grass Green, Turquoise Sea, and White. I also stamped the chevron from Pretty Patterns in Memento Love Letter and Bamboo Stalk to tie the separate tags together in the design. I love how those look nested together like that, like the pattern on a Christmas-y scarf or socks! Piercing with the Scor-Bug around the edges of the mat "anchors" the chevron. Please see the rest of our team for more inspiration using these fabulous sets! Don't forget to comment to increase your chances of winning a grab bag! That's it for October Inspiration Hops! Of course, keep checking back with us for more fun GKD projects through the month! The first set is Becky Oehler's Mistletoe Memories. This is a really cool two step set that allows you lots of different ways to arrange the mistletoe in addition to adding the berries. I really like the stitch detail around the leaves and berries. I stamped the mistletoe in Memento Cottage Ivory and used Rhubarb Stalk to give it more color. Pattern is from Merry Little Christmas pack. Cardstock is Pure Luxury Ivory and the new Christmas Pine. I added a pierced detail with the Scor-Bug embosser to coordinate with the stitching in the image. TIP: Do your Scor-Bug embossing on the back of your mat and flip to give it a raised bump, which is sometimes more noticeable than the pierced holes. Next we have Simple Snowflakes by Tami Mayberry. I love a "punchy" set like this, so I stamped them several times in the same colors as above with a 1 1/4" punch and arranged them on an ivory base. I added a 1 3/8" circle punch of the new Christmas Pine CS to accent the center flake. I also added some small adhesive rhinestones. Our last set today is Beth Silaika's Deck the Halls. Do you love these two step ornaments, or what? This awesome print from the new GKD Designer paper pack Merry Little Christmas inspired the design and color, those little diamond bursts I thought went so well with the ornaments. 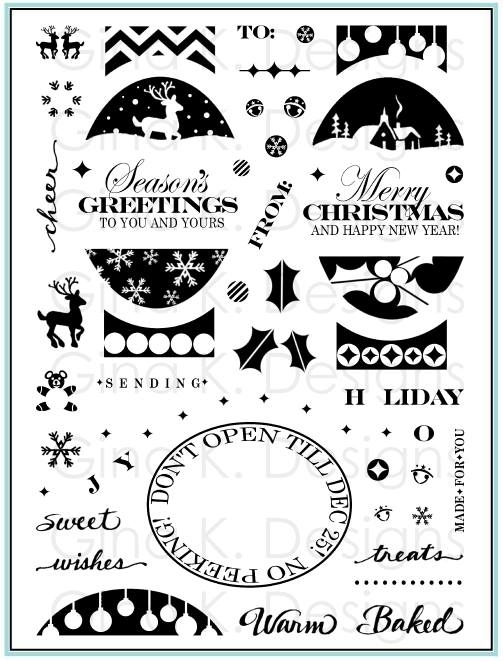 I popped the cut ornaments over the stamped wire and used a scrap from another print in this pack to make a border. Cardstock is Pure Luxury Ivory and inks are Memento Rich Cocoa, Cottage Ivory, Love Letter, and Rhubarb Stalk. TIP: Stamp the ornaments twice with different inks then snip them up or punch to paper piece for a two tone ornament. I also some added some adhesive rhinestones to bling up the details in the ornaments. 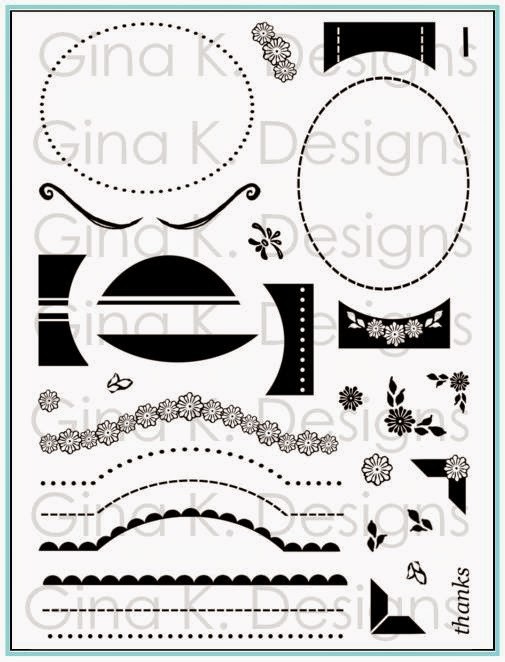 First up, we have my newest stamp set from Gina K Designs, Stately Flowers 5. This is the fifth in a series of hand drawn official state flowers, and is available for purchase in both premium quality clear photopolymer and red rubber. This set includes flowers for Oklahoma, South Dakota, and Kansas, but the mistletoe and sunflower have been specifically grouped together with all your upcoming fall and winter holiday cardmaking needs in mind, and the sentiments to match! The trick was lining up the pattern in the plaids when I added this cropped strip to the side, as well as stamping the image with the lines at right angles so the pattern wouldn't go wonky at a tilt when I went mount it on my card! Isn't that fun with a big ol' button in the center? (and some gray bakers twine) Card base is Honey Mustard. Chevron is from my Pretty Patterns set, stamped in Memento Cantaloupe. This next card was inspired by a quick trip to Target last week! Walking through the store, I spied this funky banner above the girls department, white with gray, pink, red and black line art flowers, and knew it would translate beautifully to a card! 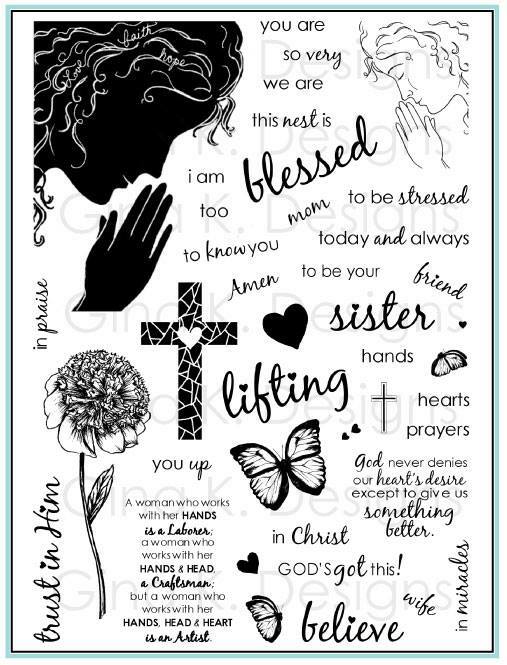 Collage stamp a background with the small sunflower using Memento Love Letter, Rose Bud, London Fog and Tuxedo Black on layering weight White CS, then add your sentiment. TIP: After using the ScorBug embosser and Scor Buddy for piercing the gray mat, I put the brush tip of a black marker into each hole to help them pop. Finally, I challenged myself to see how CAS I could go with this set for Christmas cards in a pinch! I hadn't used the smaller mistletoe image yet, and I gotta say, I like how this turned out! Just some Gina K Designs Pure Luxury Ivory, a strip of adhesive rhinestones, Memento Rhubarb for the sentiment and Tuxedo Black for the image. The scale here I think is key: tiny rhinestones, tiny image, delicate fonts, but a luxurious heavy creamy cardstock like this is a must if you are going to go this simple. joining in our hop and designing with Stately Flowers 5 this month! Huzzah! Next up, we have Theresa Momber's follow up to the one of her bestselling sets, Vogue Vases, yep it's Vogue Vases 2! (also available in red rubber) I adore stamping with sets like this, so fun to mix and match! These new additions are slightly smaller but also have a simpler, earthier quality than the fancier vases and arrangements in the first set. As much as I love her scenic sets, these vases and additions are super cool for CAS cards, check it! Stamp the bold and line art vases in Tuxedo Black on Pure Luxury White Base Weight CS. The vases are great for paper piecing and shading with markers, but I love the simplicity of just black on white. Trace flower additions loosely with markers and add silver adhesive nail heads to the centers for shine and dimension. Isn't that a sharp card? But super simple?! I love how the curves of her vases nest into one another, what a cool look! Check back as I plan to make some fun patterned background with these vases, no flowers required. Now please check out the rest of our fabulous design team's newest creations, you won't want to miss a single post! 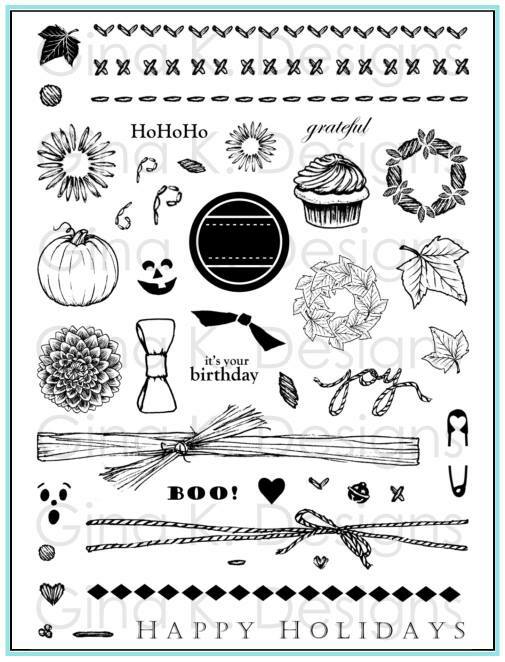 Don't forget to leave comments for more chances to win a fun grab bag of card making goodies! I forgot, one last Stately Flowers 5 card from the release! Card base is Pure Luxury Tomato Soup, embossed with CB Grace's Frame. I used the matching cut file for the flowers and leaves, and Spellbinders Labels One and Decorative Labels One (isn't that puuuurty?) dies. I sponged the Labels One with Antique Linen Distressing Ink and added some adehsive nail heads to the corner. Hello! Here is another card for Stately Flowers 5 at the release party! I got several questions about what I did here. Cardstock is Gina K Pure Luxury Kraft, Black Onyx and Wild Dandelion. I love coloring on Kraft to achieve a certain look. Just keep in mind when selecting your shades that the colors will darken quite a bit when you go over darker cardstock than white. Also, a darker marker like this Putty Copic might be normally be too dark for a shadow on white CS, but it is perfect on Kraft, looking more like a W-3 or W-5. just trace the undersides of the image, easy peasy! To have the leaf sticking out the edge just trim on the edges of the leaf inside of where the outer edge of the mat will be cut by the die, top and bottom, then have this part sticking out above the die before running it through the machine. Such a cool trick! I love this ginormous image! Hello! Have some absolutely gorgeous cards I have been meaning to share using Stately Flowers 4, designed by my lovely and talented friend Janice Whiting! These cards were so different in some ways than any other card I'd seen with the set, and I just felll in love with them! This first one I really like how she used a KRAFT mat behind the flowers. Tone on tone with the card base, I think that looks super sharp! Gorgeous coloring, too! Finally, I love the botanical collagey feel of this last card, like opening a botanist's sketch book that a real butterfly just lit on! Bravo, Janice! Love how she trimmed out the God bless, too, such a nice detail! 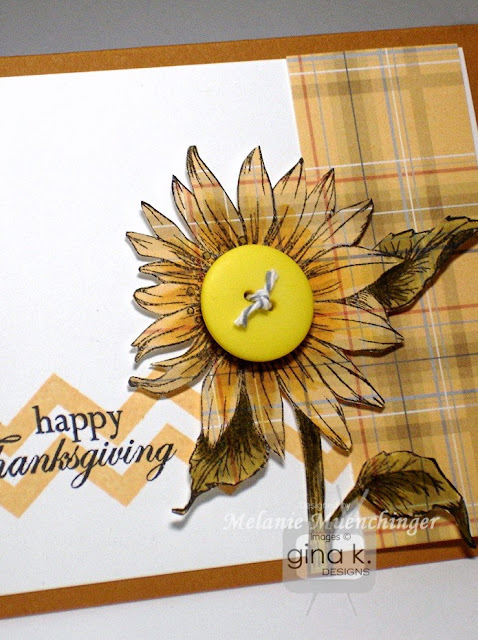 Be sure to check out Janice's blog where she has another sample with Stately Flowers 4 and leave her some love, as well as her wonderful StampTV gallery. Thanks for wokring your magic with ym lowers this month, Janice, and amany apolgies fo the delay in posting! Hugs to you all! Hope you are having a wonderful weekend, and blessed Sunday! Good morning! Hope you are able to check out the release party threads (and enter the contests!) if you weren't able to make it last night! 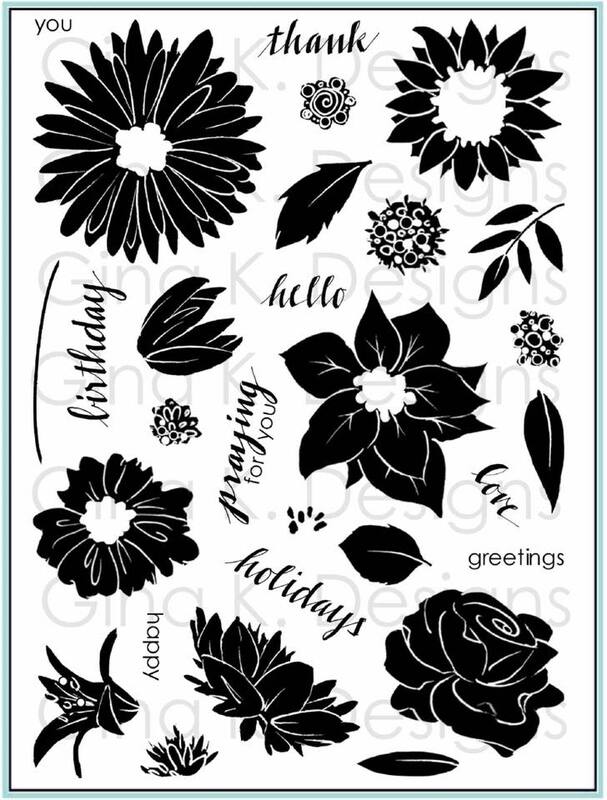 All the new products including Stately Flowers 5 (clear and rubber) and the matching Silhouette cut file are now available to purchase from Gina K Designs. Here is the full reveal of my set. Which image from this new set is your favorite? 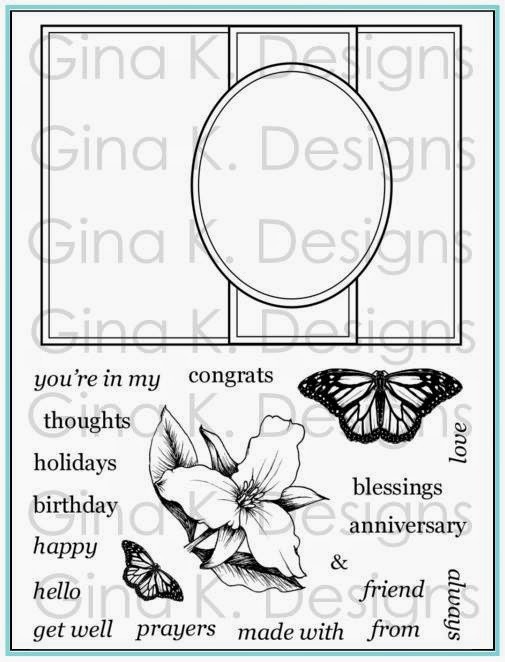 Here is a card I shared at the party, simple, easy to mass produce, no coloring! Gina K Pure Luxury White, Cherry Red and Fresh Asparagus. Isn't this Spellbinders Framed Fancy Tags Two die cut gorgeous? Here is the first version I made of this card, before I added the punched fancy corners. I go back and forth, loving the blinding white, but also the added color of the punches...! Which version do you prefer? Good morning! 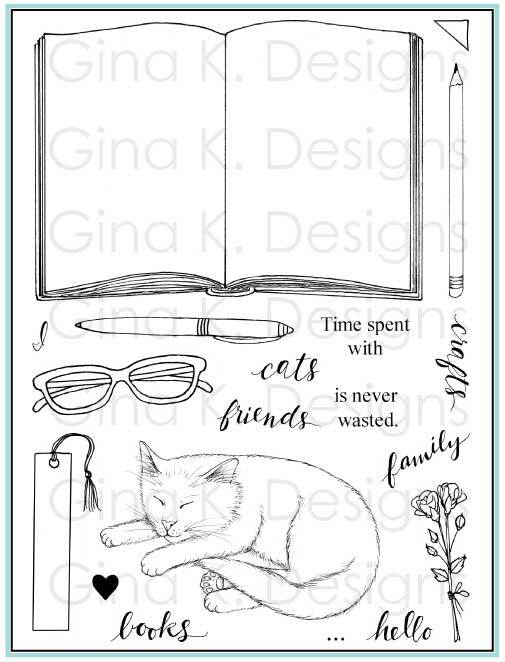 The Gina K Designs team is readying for tonight's October release party and the illustrators are giving you another peek today at the new sets coming out this evening! Here's just a taste of what you'll be seeing from each of us. I really hope you will join us tonight for Gina's newest StampTV video featuring the new sets (and cardstocks, and embellishments, oh my!) and the contests, prizes, new samples and chatting with the teams and StampTv friends! Here is my sample with the newest addition to my Stately Flowers series, Stately Flowers 5. I had to give you Oklahoma's Mistletoe in time for Christmas! Isn't that sweet? Change the color of the berries, and this little of sprig of leaves will add a lovely touch of nature to your cards year round. Supplies: Gina K Pure Luxury Kraft, Red Hot Cardstock and Spellbinders Matting Basics B set. This set also contains the flower South Dakota proudly claims: the Pasque Flower (also known as Pulsatilla, or Wild Crocus. Did you know Pasque means Easter?) Love the showy bloom with the prickly stems, a survivor that thrives gracefully in the wild! 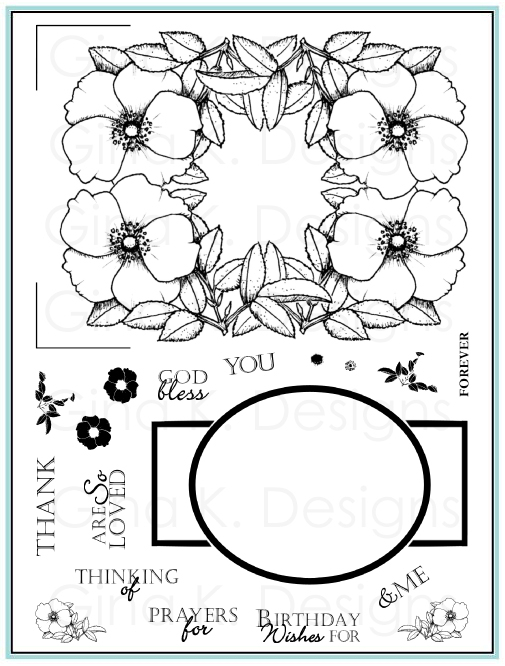 I used the matching Stately Flowers 5 cut file for the Silhouette Cameo on the flower, also available tonight. Supplies: Gina K Pure Luxury Lovely Lavender, Wild Heather and White Cardstock. Spellbinders Hexagons, Memento Tuxedo Black and Sweet Plum. Copics V06, V09, V17, Y06Y19. Can't wait for you to see the full reveal of Stately Flowers 5 tonight at 7 PM CDT! All new products will be loaded to the store at that time for you to get your shop on! See you this evening at the party! Good morning! Another special offering from CardMaker out this month: I got this beautiful special issue in the mail last week and it is super-sized packed full of techniques, embellishments, design elements and trends from A to Z! 112 projects on a whopping 148 detailed, full color pages. I got a LOT of ideas from this issue as well as seeing some products I was not familiar with (honeycomb paper?!) and now really look forward to trying them out! 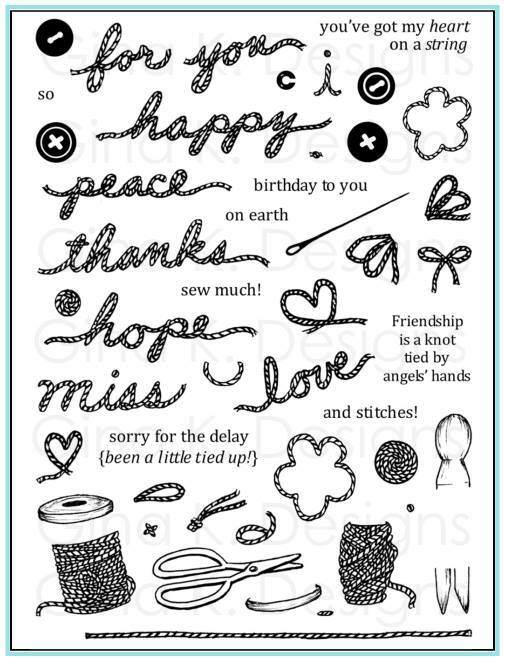 So fun seeing lots of "my peeps" in there, plus terrific designs from the editors of CardMaker themselves! I have three cards in this issue: C for Chevron, D for Doily, and P for Punches!) My favorite submission is this card using Spellbinders Edgeabilities to create the chevron. See the magazine for step by step instructions. Greeting is from my Arranged with Love set. Unfortunately I do not have an extra copy of this issue (and I am sooo keeping the one I have! ), but it is one you will want to keep in your crafting arsenal! I love how they went from A to Z with naming all the different ways to dress up your cards, highlighting the classic tried and true ones and as well as ones we forget about or very inventive new things I hadn't seen before! You can order this product (or download a digital version immdediately) from Annie's by clicking of the A to Z issue above. (and you'll see more pictures of projects featured inside at that link) Enjoy! I've never seen an issue of this magazine, but it certainly does look intriguing to look at with lots of fantastic ideas. Love your card too. I would love to win an issue. I'd love to give one away so you can see the gorgeous layout of this fantastic issue, the colors and design just blow me away! I'm lovin' their new look! Leave a comment below to enter, subscribers get two chances, so subscribe today if you haven't already! I'll post a winner Wednesday. Hello! Sorry I haven been posting this week, what a crazy few days! (I mean, cah-razy!!) 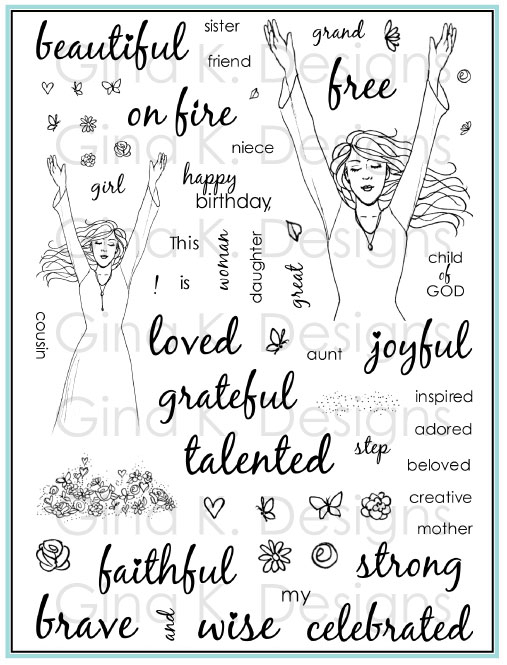 Anyway, I spied Gina is posting sneak peeks for our release next Thursday, and stamping for it, that is next on my list! Yep, it's time for the 5th installment of my Stately Flowers series! 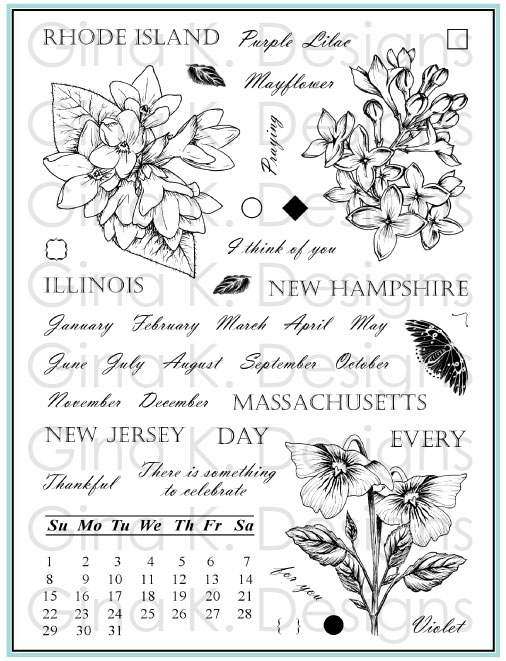 Do you know what states these sneak peek flowers represent and any guesses what else might be in the set? Check Gina's Blog for a peek at Tami Mayberry's newest set as well, and the sneak peeks will continue the next several days! Awesome stamps and cut files this release, (plus some stuff I did not even *know* about until this morning), so excited! Be back to share a little about some new exciting publications out on the newsstands, my copies are already getting worn out from paging through enjoying the inspiration! This card uses the tub from Beyond Baskets and the Christmas topper from Basket Additions. I often cut off the liner from this topper after stamping to make it more casual and it's perfect for this red pail. Instead of the handle or rope stamp, another fun addition to these containers is to make a wrap or handle by adding bakers twine, hemp or ribbon. I tied each end in a little knot and just attached each side to cut out with Mono Multi. Cardstock is Pure Luxury Ocean Mist, Fresh Asparagus, Red Hot and White. Embossing is Grace's Frame by Cuttlebug. So, Christmas! There's a lovely bit of chill in the air for the first time this season, and instead of stamping today for WCMD (because I did a BUNCH this week!) I've been enjoying looking ahead a little to Christmas and bought a couple "just the right things" that were on sale online for friends, field a recipe to try for Christmas morning and printed out a gift list. I have been doing a lot of FLYLady the past month and am also working on putting together my Control Journal. Even without the printed lists the past few weeks, doing the missions and getting my house de-cluttered feels great. The place looks better than it has in a long time and I don't feel overwhelmed with all that needs to get done and what is undone. I will share more about this soon, as often as I can. She shares a lot more than just how to organize your home and your life, but how to de-clutter your thinking and get rid of all the guilt and misconceptions that goes along with it! I strongly recommend checking out her site and giving it a try. A great gift to yourself, family and home: let the organized person figure it all out for you! Are you ready for a great deal? 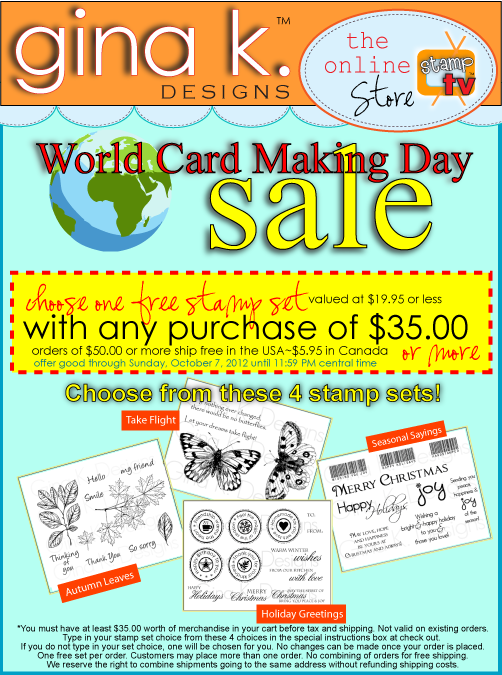 In honor of Wold Card Making Day this weekend, Gina K is running this fantastic special Saturday and Sunday: select one of the four free stamp sets above FREE with any purchase of $35 or more in the Gina K Designs store! 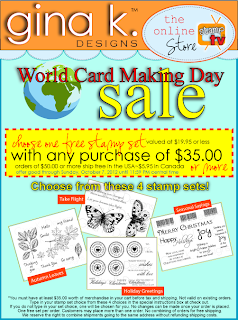 Best bang for your buck: buy three stamp sets and get the Free with Three set plus one of these four sets PLUS free shipping, that is almost $40 worth of stamps for free plus free shipping to you on all the fun stuff you order! The sets she has chosen are perfect for the fall and winter holidays coming up! If you already have these four, consider what a great gift one of them would make for a stampy, crafty friend. :) No limit to how many free sets you can pick up, but each order of S35 or more must be placed separately to qualify for one of these 4 sets. Eek, Beyond Baskets clear version sold out! Thanks so much, really glad you are loving these new containers and options! :) Hope it will be back in stock shortly, but until then, the rubber version IS available. 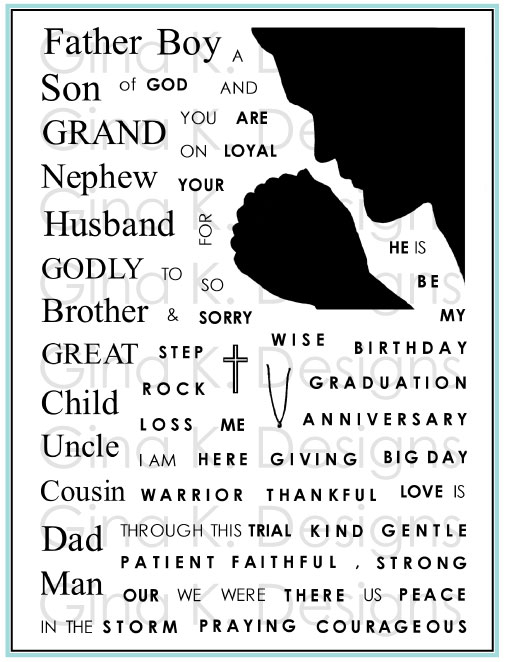 Since each image in Beyond Baskets has a straight edge on the top, it is easy to line up even the rubber images with the toppers, however, lining up the words or piecing together a sentiment with several words is easier with the clear. just something to consider when ordering! Card also use Pure Luxury Honey mustard, White and Kraft. TIP: When adding the rope, glue only the end to the sides of the container so the middle is free, adding some nice, realistic dimension to your card. Coming up, some questions and answers, "Stately" inspiration, and a really great special you won't want to miss!! !